Your inner glow can not be rivaled, but a hint of light pink lips paired with a soft mica shimmer can surely highlight your playful side. A delicate cotton candy flavor adds a touch of sweetness to freshly hydrated, smooth and sparkly lips. Apply lightly for a subtle shimmery tint, or layer it up for a bolder appearance. 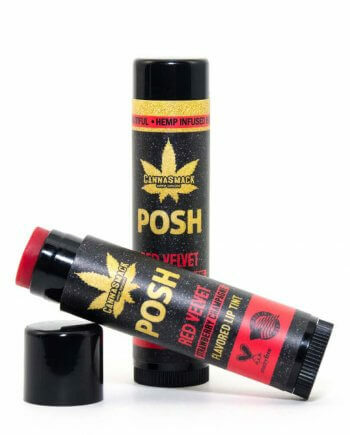 Just like all of your other favorite, non-tinted CannaSmack, our all natural POSH formula is infused with premium hemp seed oil, providing a kiss of vitamins A, B, D, E and Omega 3&6 fatty acids. This hint of glitzy gleam is sure to polish-up any look. For best results: pair with our CannaSmack leggings! Ingredients: Beeswax, Coconut Oil, Castor Seed Oil, Flavor, Titanium Dioxide, Sunflower Seed Oil, Red 40 Lake, Bis (Glycidoxyphenyl) Propane / Bisaminomethyl-Norbornate Copolymer, Aluminum Hydroxide, Red 28, Red 22, Cannabis Sativa (Hemp) Seed Oil, Saccharin, Tocopherol (Natural Vitamin E Oil), Safflower Seed Oil, Aloe Leaf Extract. This one smells weird. Color is pretty. I’m not sure how well it works as far as chapped lips are concerned, mine aren’t chapped to begin with.